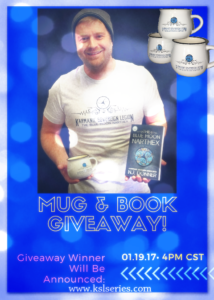 PUBLICLY follow us on all socials, like, share this post & comment for chance to #win this #mug & #book #giveaway! Winner TBA 02/02/17 @ 4:00 P.M. CST. After the Train Wreck. Chapter 2 of The Blue Moon Narthex! 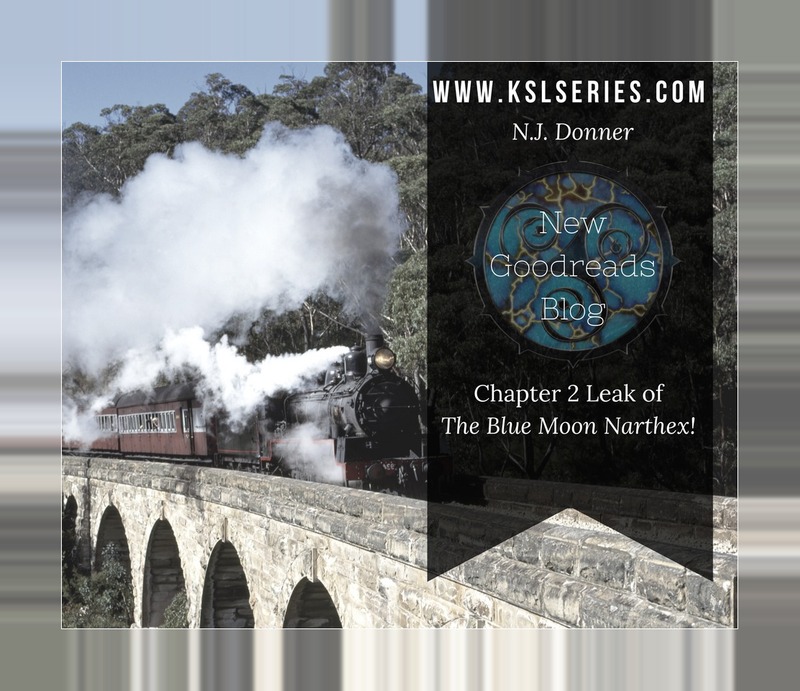 Last week I gave you a sneak peek of the first chapter of The Blue Moon Narthex. If you haven’t read it yet, you can find it here! We left Cole in the smoky aftermath of a train derailment…. Cole’s father, Richard McCarthy, ran a railroad, and trains play a big part in Cole’s adventures. The early 1900’s had been the heyday of the American railroad. New lines had been built to move people and goods around the country. But rising operating costs, government price controls, and tension between railroad companies and unions made the years prior to World War I stressful for railroad executives. Would you like to know what happened to Richard and Cole in the derailment? You can access the second chapter at the link below! READ CHAPTER 2 OF THE BLUE MOON NARTHEX NOW! I hope you’re enjoying the beginning of the story. Please share these links with other readers. Keep posting your questions and comments below; I love interacting with you all. I’ve never been good at waiting. I can hardly bear the anticipation of Christmas. I’m always far more excited about the special gifts I’ve purchased and wrapped for other people than I am about those for me. I’m really excited to share this story with you! One of the most difficult parts of writing is the long delay between creating a world and being able to share it and talk about it with readers. Please read the first chapter and let me know you think. I’ll plan to share a few more chapters with you in the coming weeks. Enjoy this sneak peek and share it with your friends who love to read. It’s just 32 days until the release of The Blue Moon Narthex, the first book in the Karmanic Sovereign Legion Series. Over the next five weeks we’ll be leaking intel from the legion and even some chapters! Karmanic: The power of the world’s Karmanic matter will be our guide. Let us only assist the good and fight the urge to sympathize with the bad. We shall not use this great power for our own selfish purpose but for the greater good of all. Sovereign: Not governed by borders or governments of mankind, we are free from influence that may pull us from our mission. We are free from the judgments of anyone based on age, gender, race or religion, as Karma does not see these attributes, but only one’s actions. Legion: A group that cannot be divided and will not serve one but is a servant of all. We are bound together with the common goal of balancing the good and bad actions of the world. Let it be known on this 12th day March 1414, that the Karmanic Sovereign Legion will be formed. As the founding members of this legion, we are sworn to protect and uphold all good deeds of the world while defeating the bad deeds of the few. The use of the Karmanic power will be respected and used only for the greater good of all and not for the benefit of one. This Legion cannot be successful without the inclusion of all people. The Karmanic Sovereign Legion will promote equality among all, regardless of gender, creed, ethnicity, or age. All words spoken will be held with same respect no matter who speaks them. We and all of the Karmanic Sovereign Legion will uphold this doctrine above all else. Coming next week: Read Chapter 1 of the Blue Moon Narthex! Preorder The Blue Moon Narthex now on Amazon! My journey toward writing a novel began with building imaginary gadgets and worlds in my mind that started from a simple idea. The story around those came later. I’m a builder. As a kid, my two sisters and I, along with our three cousins, would build forts in the barns or the trees at my uncle’s farm. We’d scavenge for any scraps of wood we could find, then spend hours planning the “what if,” sawing, and hammering. Our parents still remind us how many hammers and saws we lost. We didn’t have nearly as much fun playing in those forts as we did building them. As soon as we finished a fort, I was already dreaming up the next one. What if we made it taller, or bigger, or built it in a different place? We could discuss ideas for hours. What if… someone had a device that could help control Karma? How would it work? What would it look like? What powers would it have? What if… that device could be concealed on a wrist cuff, or necklace, or at the top of a cane, and the world thought they were ordinary objects? What if… the people who had these devices created a secret headquarters? What would it look like? Where would it be hidden? How would it be hidden? What kind of technology would they have? What would their communication system be like? How would the world be powered? And on and on. I made drawings of objects and filled pages with maps and blueprints of the world. Then the story began to emerge. What if the members of the secret society had to keep the powerful devices out of evil hands? Start with something common and simple, and don’t stop asking what if… until it becomes something uncommon and extraordinary. Want to know more about the devices and world I imagined? My first book The Blue Moon Narthex, is available for pre-order now on Amazon. We also have a giveaway running now:click here to enter! 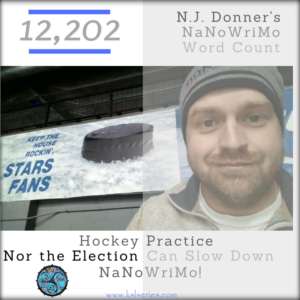 Wednesday was the last official day of NaNoWriMo. Did you get as far as you wanted? I didn’t. But that’s not the end of the story. Writing is a journey, and sometimes a story takes us on detours. Eighteen months ago, I thought I’d finished my first novel, so I found an editor and discovered I had finished a rough first draft. The story had more to say. I had more work to do. I’m glad I didn’t give up on the process. 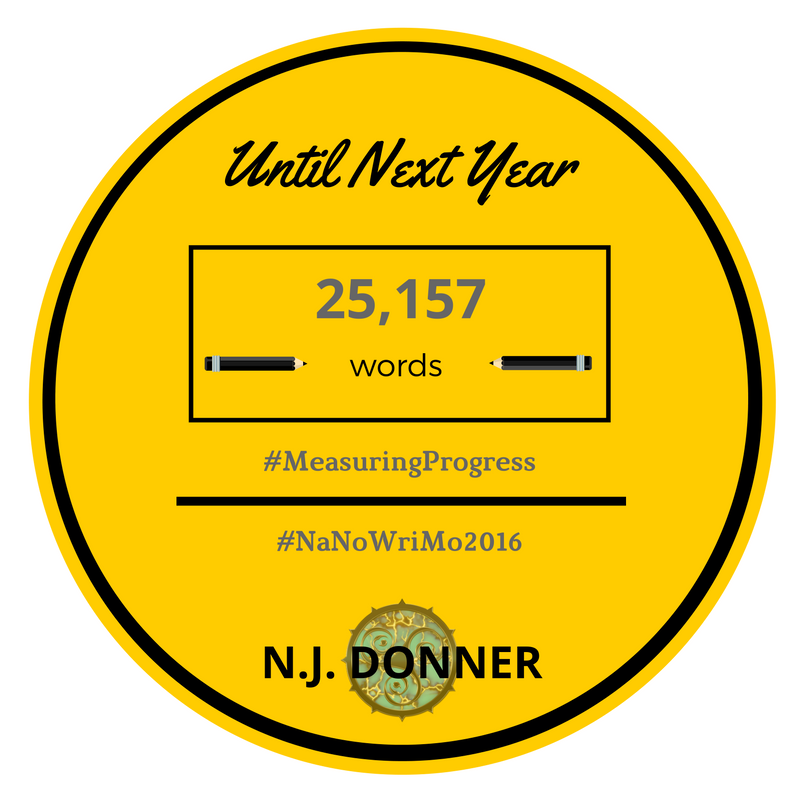 Sometimes it’s hard to measure our progress as writers. We type away early in the morning or late at night, usually by ourselves. We often don’t get as many words on the page as we hoped, but that doesn’t mean our work is futile. I’ve found that sometimes my fingers need to stop typing so my mind has time to catch up with the plot, or the character, or the setting I’m trying to create. I must allow myself time to think. We need others to help us see our progress. I have an editor/writing coach who helps me notice and celebrate milestones along the way. My wife is also a great cheerleader. Find your people—those who will encourage you, challenge you, and remind you that progress isn’t always measured in word count. 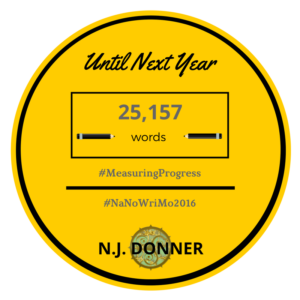 Celebrate your progress during NaNoWriMo. Share it with me and others in the comments below so we can cheer you on. As I mentioned in my last blog, writing isn’t my full-time job. My writing time must fit around running a company and keeping up with my wife, kids, and pets. I’ve found I’m most productive when I write in the proper environment. For me that means some place free of distractions. In other words, I need a space where I don’t look around and see a million other things that need my attention. I’m in the process of creating an office space at home where I can get away to write. I really enjoy an organized space, free of clutter or other paperwork. I often write at a local coffee shop. I try to find a table in the back away from the bustle and activity of the counter and front door. I wear ear buds and listen to music so I won’t start writing stories based on the conversation at the next table, though that would be fascinating. I think I could write a book using only what is overheard in the coffee shop. I listen to different types of music depending on my mood. It might be anything from classical to mellow or meditative, but it has to be instrumental only. Lyrics distract me. Wherever and whenever you write, create an environment that fosters creativity. Hang in there! We’re halfway through NaNoWriMo. I’m through chapter 15 of the sequel to The Blue Moon Narthex. (Pre-Order TBMN here on Amazon!) Tell me about your favorite place to write in the comments below! 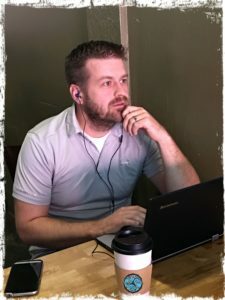 Writing isn’t my full-time job…yet. I run a steel company and have a busy family to keep up with. Plus, we just adopted a high-energy puppy from the Nebraska Humane Society, a new sibling to our large German Shepherd and grumpy cat. Life just doesn’t make it convenient for me, or many others, to write. I’m under deadlines and the stink eye of my writing coach to be making progress on my second novel. Thank goodness NaNoWriMo (National Novel Writing Month) is here and I’ll have company on this journey. So, this month, I’ll be shutting off my smart phone and squeezing in hours to write early in the mornings, late at night, and whenever I can sneak away from the office. I’ll be trying to crank out 75,000 words in November. 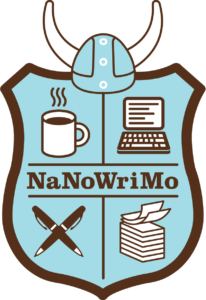 Follow my NaNoWriMo journey here and on my social media feeds. I’ll be posting my progress, my road blocks, and some fun pictures of when and where I write. You can find me on Instagram, Twitter, & Facebook! 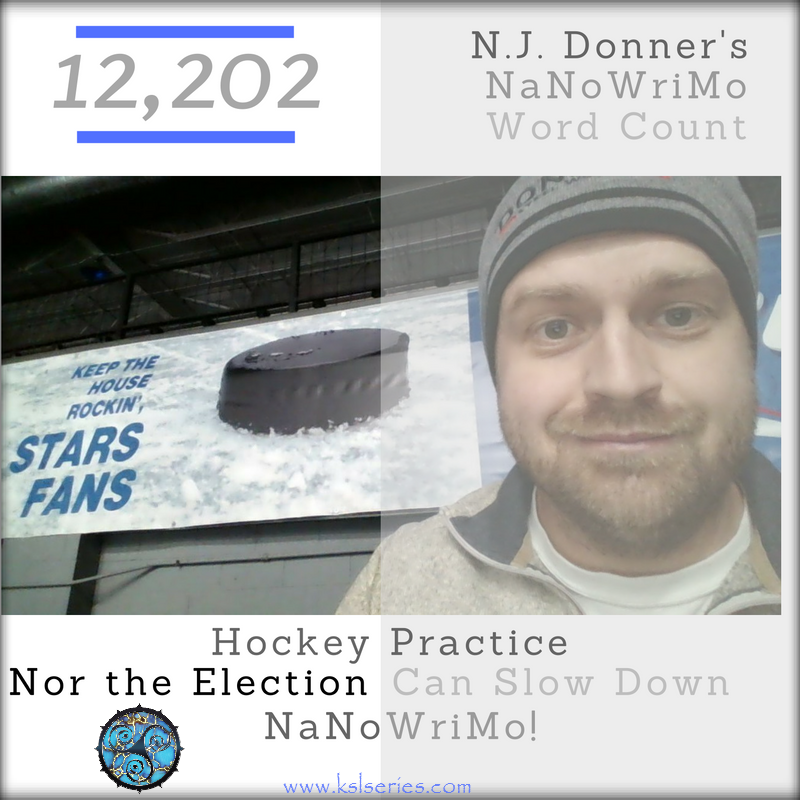 My first milestone is to reach 20,000 words before the election. (I need something to distract me from politics!) Then I’ll set my next milestone. Who’s with me? Who’s writing this month? 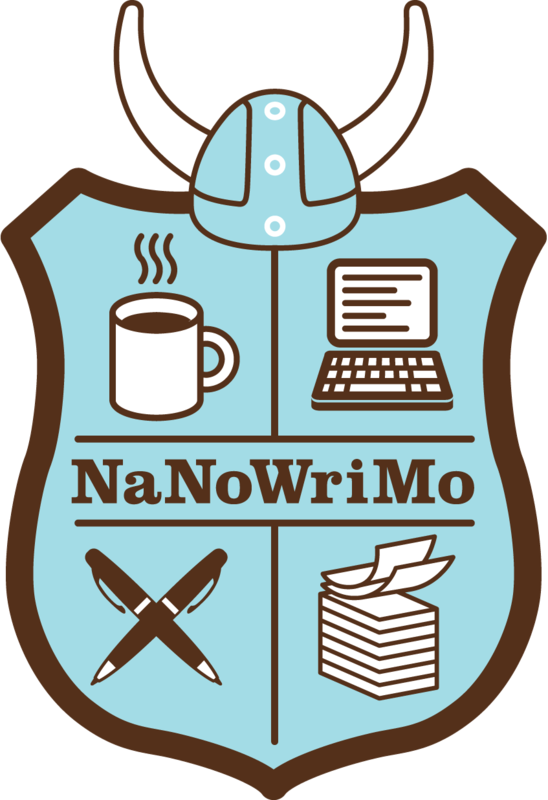 Share your NaNoWriMo story in the comments below. Let’s stick together and get this done! Hi, Friends! I’m excited to meet all of you who love reading—particularly about evil forces trying to take control of the earth and the secret societies working behind the scenes to thwart them. My name is Nick. I go by N.J. when I’m writing. (I’ll let you guess what the J stands for.) My first book, The Blue Moon Narthex, debuts on February 7, 2017. I can hardly wait to share this story with you. 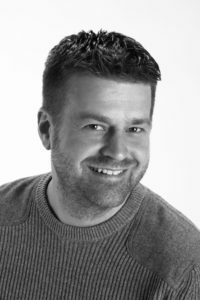 Before I tell you more about the book (and I will in upcoming blogs), let me tell you a little about me and my writing adventure. I’ve always had an active imagination. I love to build things and figure out how things work. I am probably what you can call a perpetual day dreamer, and have always tried to put all those thoughts bouncing around in my head to good use. In college, I was in a band, traveled, studied business and international affairs, and worked part time as a welder. I turned that part-time job into a steel company. Even while building a business and having a busy family life with my amazing wife, Amanda, and our three kids, I continued dreaming up ideas and building worlds in my head. What if… is the constant refrain that runs through my mind. A few years ago, on a long plane trip, I started to write down that world and those characters, and to form the adventures they could have. The result is the Karmanic Sovereign Legion series. The first installment, The Blue Moon Narthex, is available for pre-order now on Amazon! While we’re waiting for the launch date, we’ll have lots of giveaways on Goodreads. Thanks for following me; I will be writing every few weeks!